PSSI Global Services has successfully transmitted a 10-path, multiplexed, HD feed via satellite from Toledo, Ohio, to Charlotte, North Carolina, and then back to Toledo in 1.09 seconds — this unprecedented, low-latency transmission surpasses any known speeds previously achieved via satellite. Executed for NASCAR Productions for the live presentation of a recent ARCA Racing Series event, the transmission involved two satellite hops, production switching, two HD encode sessions and two HD decode sessions. To accomplish all of this while significantly reducing latency, PSSI Global Services leveraged the latest encoding and decoding technology from Ericsson. PSSI Global Services, an industry leader in broadcast engineering and event management solutions, successfully transmitted a 10-path, multiplexed, high-definition (HD) feed via satellite from Toledo, Ohio, to Charlotte, North Carolina, and then back to Toledo in 1.09 seconds. This unprecedented, low-latency transmission surpasses any known speeds previously achieved via satellite. The results of this two-way transmission show that PSSI Global Services can achieve a one-way transmission in less than 500 milliseconds. This includes the inherent delay of about 240 milliseconds that occurs in all satellite communications due to the distance of approximately 44,500 miles that a signal must travel to get from Earth to a satellite and back. NASCAR’s VP of Operations and Technical Production, Steve Stum, noted that this could be one of the most significant improvements in the technical development of at-home production services. Specifically for us, it clearly sets a strong foundation for the future of our at-home production events. 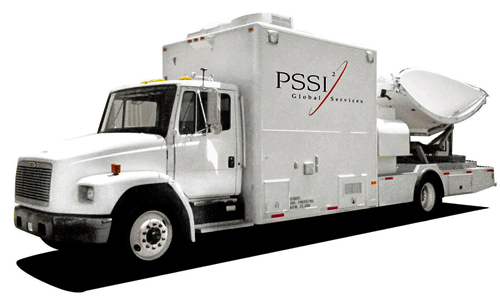 For more information on PSSI Global Services’ capabilities, projects and services, visit.